Crunchy. I love crunchy. I’m pretty sure you do, too. I want lots of crunch. Crunch makes me happy. 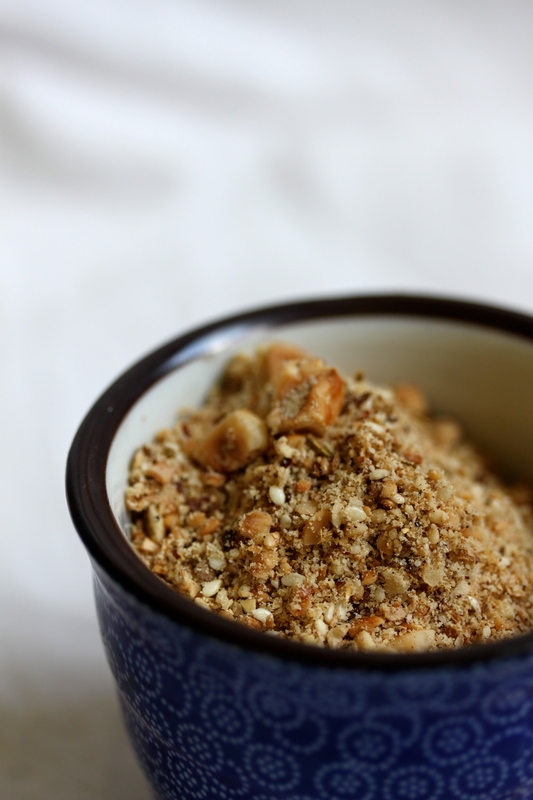 Do you know dukkah? This dry Egyptian mix of nuts and spices, where you first dunk a piece of bread into olive oil, then into the nut mixture, then eat? Yeah? It makes me happy. Especially because of the hazelnuts. Anything with hazelnuts has to be good. And if it requires the action of dipping, well then, I’m sold. Dry-roast hazelnuts on a low flame till the skins crack and the nuts take on a golden, brown-speckled hue. I usually do this in two batches, first getting the skins to crack, rubbing them between a towel, then letting them have a second go in the frypan, for that deliciously toasty hazelnut flavour. Afterwards, let them cool. Repeat with the almonds and the sesame seeds. Next, combine the cumin, coriander and fennel in the pan and dry-roast them until they smell good and have taken on a little colour. Once everything has cooled down, pulse the nuts and seeds, each on their own, until roughly ground. Grind the spices with a pestle and mortar until also roughly ground. Combine with the remaining 3 ingredients. You could of course replace some of the almonds with pistacios for a bit of colour, but quite frankly I don’t think this needs changing. Why do I always use stock powder? Because it has so much more flavour than plain salt, that’s why. If you don’t like it you can replace it with whatever salt that makes you happy. Just adjust the amount, okay?